Improper nutrition may not have on the future mother no significant negative impact, but it is very harmful to the baby and can cause the most serious consequences. Therefore, if you are willing to make every effort to only your child was born healthy and strong, read the article and follow the tips. In no case did not need to eat "for two" in an attempt to give your child a greater number of different nutrients. The most important condition of a balanced diet - it is important not the number of eating the food, and the variety in the diet and a good assimilation of food. Following this rule, you will be able to provide the fetus by necessary nutrients. A pregnant woman should not too abruptly to change the usual for her diet. If before the pregnancy, you ate very diverse and at fully, you can not worry about changing the diet in the first half of your pregnancy: eat as before. Organisms of every future mother is different, as is individual her pregnancy and fetal development. Therefore, in no case do not need to blindly believe all the advice and follow each of them. It is better to try to listen to your body and eat, focusing on sanity and recommendations your doctor. Expectant mothers should be very attentive to the food they consume, listen to the desires that may arise, and do not be afraid to tell about it her husband or relatives. Even the desire to eat something rather unusual (clay, chalk) - not strangeness, but probably a sign of a lack of certain substances in the body. And to treat to these wishes need very serious. Diet for pregnant (if she is completely healthy) is usually not necessary. It is best to include in the menu of future mum all the main products: milk, meat, fish, bread, poultry, fruits and vegetables, nuts. They need to be combined in sufficient quantities, to the pregnant woman and the fetus will be provided with all the necessary nutrients. Try to carefully than usual chew all food. It is best to chew on pieces of food 30-40 times. It improves digestion and the body receives more nutrients. And you should not load up before going to bed. For pregnant women it is very important to regularly defecate. This frees the body from the partial oxidation products that are formed in the maternal organism and baby. For this purpose, you need to frequently eat foods that have a large number of plant fibers. These include: rye bread, bread with bran, buckwheat, oats, millet and barley porridge, carrots, dried fruits, apples and juices with pulp. Such products stimulate bowel activity. Vitamins, trace elements and mineral salts. 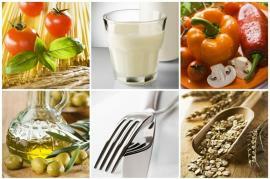 Their sources - a wide variety of products: meat, fish, eggs, vegetables, fruits and cereals. In the first half of pregnancy better is accept food four times a day. 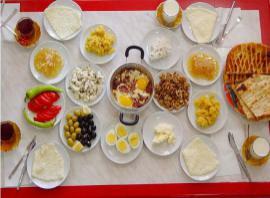 Thus breakfast should be 30% of caloric content the total diet per day, second breakfast - 15%, lunch - 35% and dinner - 20%. To reduce the pressure on the fetus during the second half of pregnancy, it is necessary go to five or six meals a day. And need to eat smaller portions. You should also try to do the proper distribution of food throughout the day. Know that proteins increase metabolism, and a long time delayed in the stomach and stimulate the nervous system. Therefore, meat, eggs and fish are best to eat for breakfast and lunch. And here the dinner let consists of dairy and food of plant origin. 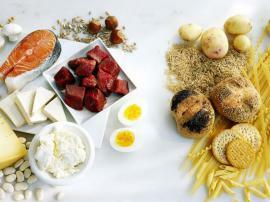 Should You Avoid Carbohydrates To Lose Weight?